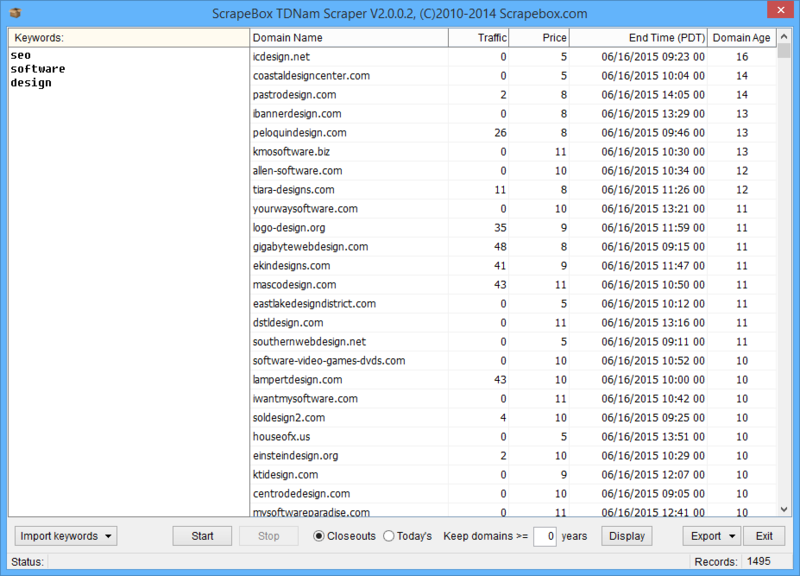 If you are looking for domains that have already been aged up to 20 or more years, that have backlinks and valid Pagerank for $5 then the TDNAM addon included free with ScrapeBox is ideal. This addon will allow you to type or load a list of keywords you wish to have in your domain name, then it will collect all the matching Closeout domains from the TDNAM auctions. It will display the domains traffic, also the domains age and auction end time. This is great for sourcing established domains for your next website or project. Once installed, you can simply type a keyword, select if you want to check the closeouts or regular auctions and click Start. The addon will fetch all matching TDNAM domains in all extensions such as .com, .net, .org etc. You can sort the results by domain age, or domain traffic or auction end time. If you are looking for aged domains, you can enter an age in years and display only those domains older then the age you specified. Once you found a domain you like, you can right click it and open the TDNAM auction page in your default browser to purchase it from TDNAM/Godaddy. You can also export the results to a .CSV file, or export just the domains to txt file to send them back to the ScrapeBox harvester and check for Pagerank and search engine index status. Or use other free ScrapeBox addons to check the domains Social Metrics or the Domain Authority, Page Authority, MozRank and backlinks using the Page Authority addon. View our video tutorial showing the TDNAM Closeout Scraper in action. This is a free addon included with ScrapeBox, and is also compatible with our Automator Plugin.